Prime Minister David Cameron has been transformed into Peter Parker, protagonist of Marvel’s Spider-Man franchise, in a hilarious YouTube video, which features the Tory leader strutting through the streets of New York City. The mash-up, put together by Huw Parkinson, superimposes the PM’s face on to the shoulders of actor Toby Maguire in a sequence from the series’ third installment from 2007. 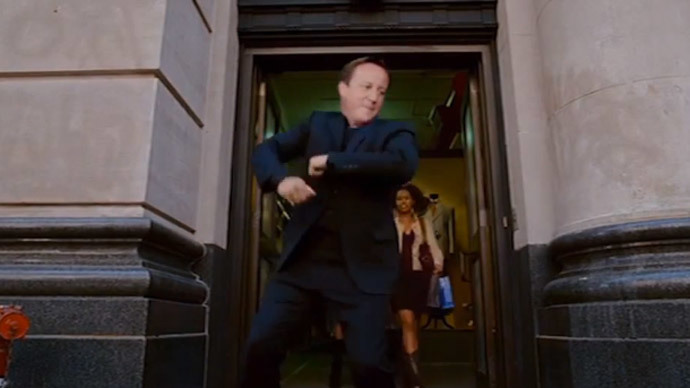 Cameron tells pedestrians about his recent election victory and how he intends to form a majority government as he dances through Manhattan to funky music. The PM won a narrow majority in the general election last week, despite predictions from pollsters that Labour and the Conservatives would finish neck-and-neck. In a biting satire of Cameron’s election campaign performance, he is also shown apologizing to actress Kirsten Dunst for accidentally declaring his love for West Ham United Football Club. During a campaign speech, Cameron made an off-the-cuff remark about his support for West Ham. He was ridiculed online, as he has previously claimed to be an Aston Villa supporter. “Apologies for the brain fade,” he tells Dunst, who played Spider-Man’s love interest Mary Jane Watson. The minute-long clip draws on a scene from Spider-Man 3, where Peter Parker is given a boost of confidence after an alien symbiote invades his body. Spider-Man 3 received mix reviews from critics at the time of its release and has a 6.2 rating on the Internet Movie Database (IMDb).